I ran across one testimonial from an individual who, like myself had used COMPANY X paint. Three days after filling our pool, the paint blistered and started flaking off. See the attached photo. We saved for three years to be able to afford to clean and paint our pool (ourselves). I am afraid it will be a while before we can repaint this horrid mess. 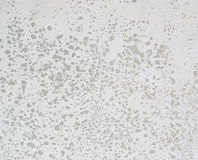 The COMPANY X paint we used is the Acrylic Aqua Kote. 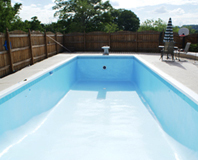 Can your pool finish be applied over this type of paint? “I am writing you to let you know about one of your competitor’s products. In June of 2005, after a week of internet research, I purchased an “Epoxy Hi Build” pool paint from COMPANY X Paint in New Jersey. 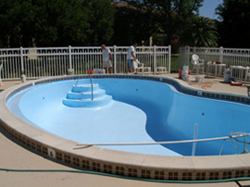 We wanted to do something different with the look of our pool so we painted the bottom of the pool paint a dark blue, the sides a sky blue and the steps down the pool a bright yellow with “sun rays” extending out into the bottom of the pool. We followed their preparation and application directions to the letter. It was very impressive and we received many complements from our friends and family. A year later we began to notice that the paint was coming off in thin layers. A week after the paint delaminating, we began to notice that the bottoms of our feet were turning blue after only a few minutes of walking in the pool. Having a concern that our 12 year old and other children would be playing in the pool, we called COMPANY X Paint and explained what had happened and that our primary concern was that the blue on our feet could be some sort of “toxic” residue. The customer service rep assured us that it wasn’t toxic and that this was the “first time” they had ever heard of this happening. They asked us to send pictures so that they could verify what I was telling them. Thereafter, I sent them pictures documenting the problems. The V.P. emailed us and said he was going out of town for a couple of days and would call upon his return. No one ever contacted us again. I called back and they said that no one was around to help me at that time. No one ever contacted us. I called again this year and got the same run around. To make matters even worse, my wife’s brother visited our house and was so impressed at the look of the pool that he purchased and applied the same paint shortly after we did. Thank you for your time last week, I found our telephone conversation to be very enlightening and I greatly appreciate all of the information that you gave me. As I told you, we had recently painted our pool with COMPANY X paint. 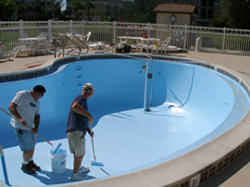 We worked very hard to properly prepare the pool surface as per the paint manufactures instructions. When we had finished, the pool was absolutely beautiful. However, our joy was short lived! After following the manufactures instructions for drying time, we filled our pool. Four days after we filled it, the paint failed miserably! 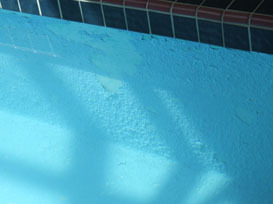 The failure was not limited to just a few isolated spots in the pool, the entire paint job is sluffing off! We are a Hotel and we depend on our amenities to attract customers. All of the other local Hotels have a pool and we lose business when we can not compete because our pool is down. We have avoided closing down the pool to this point because this is our busiest time of the season, but, the failed paint is coming off so badly that I have lost one skimmer due to it being plugged with paint chips and I have been unable to remove the clog. Also, the pump and filter are taking a beating and I can not get the flow rate up to where it should be. I have spoken with a rep at COMPANY X and he asked me to send him an e-mail and pictures. He told me that when he received them that he would take the appropriate actions and would be in touch with me. That was the first week of the month of June and I have still had no reply from COMPANY X. I sent them another e-mail on 6-14 asking them to please acknowledge that they had received my original e-mail and the pictures; I have still had no reply from them at all. We will be adding our name to the plaintive list in the up-coming class action law suit that is being brought against COMPANY X. Sadly, it looks like our loses are going to be high due to the fact that they seem to be ignoring us and have not responded to the problem that they have created. I am looking forward re-doing our pool with your Ultra Guard products since they seem to offer superior protection and a 100% guarantee. The fact that you walk your clients through each step of the process and require control numbers; shows that you truly care about your products and the satisfaction of your customers. Thank you! My only regret is that we did not find, and use, your product in the first place. I am attaching a couple of pictures of the failed COMPANY X products in hopes that it will help prevent others from using an inferior product and having to deal with such a mess! I am VERY interested in your product, Ultraguard, as I have an in-ground pool (hybrid fiberglass I believe it is called) where the 1st 3 feet of the sides are fiberglass, and the bottom is concrete. It slopes from 3 feet to 9 feet deep. 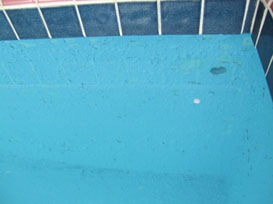 I had an epoxy nightmare when repainting the bottom of the pool 5 or 6 years ago. All I can say is I am very reticent about refinishing the pool surface. I have let the finish come off during the last 5 years by itself, and it is now coming to the point where the bare concrete is showing through. 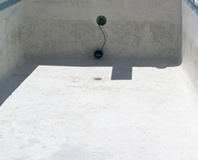 I coated my concrete pool with a two part epoxy system last year. I now find that the blue color comes off from the surface on to my feet. If I were to overcoat this pool surface with your pool surface system do you warranty that your pool urface system will adhere to what I have and that it will not chalk in the future ? My pool service company recommended an Epoxy pool paint with a bond coat. 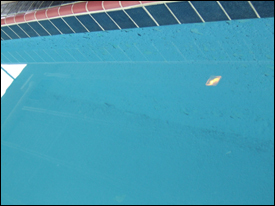 They felt this was the best material for our swimming pool interior considering it was a 2-coat system and was superior to other Epoxy pool paints. It failed the first year with blisters and delamination. It had a five-year warranty, which they refused to honor. They claimed we had a high water table and the bond coat did not hold, causing the failure of the topcoat. 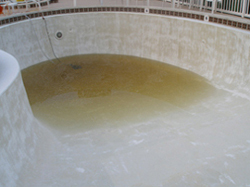 The entire pool interior was redone with UltraGuard. OK, I like your website and the looks of your product. 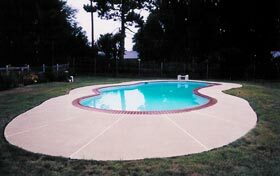 My pool is 30 years old, (HallMark brand-20X40-Kidney shape)–Concrete bottom with 3/8″ thick fiberglass sidewalls pannels. Originally the bottom was plastered with white cement and marble dust but metal tools were used in the finishing resulting in rust spots. Our installer elected to paint the bottom and I was dumb enough to let him. Bubbles developed in the sidewall and became numerous over the years but have never seemed to leak and I painted over the fiberglass on about the third painting,. I have painted numerous times with rubber based *Benjaman Moore” paint and two years ago I decided to try an Epoxy from COMPANY X. Another dumb move on my part. Some blistering occurred and chalking started late into the first year. Color is deep blue and this year the kids look like ‘smurf’ when they get out. I developed a leak in the concrete late last year which I found an fixed. I now have another that just started. I also have some hairline cracks in the steps. 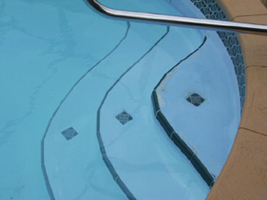 I am concerned with the sidewalls, namely the bubbles and also the gasket used between the panels (21 5/8″ stainless bolts hold each set of panels together and the panels set approx 2″ into pool bottom). I am considering using your product either late Fall or early Spring and am open to suggestions. If you suggest filling it in, you will have to fight my wife. Last year I primed my pool with Gunzite 2 part primer, I did all the prep work that was recommended, then painted my pool with Olympic Zeron Premium Epoxy pool paint. The pool looked great for about 6 months then it started to chalk off and what a mess that is, my wife complained about the soles of her feet being white as she emerged from the pool and her footprints she left behind in the bottom of the pool. Obviously we are very disappointed with this product. 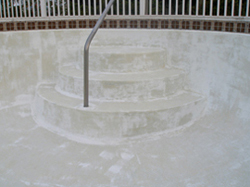 Dear Sir – I contacted you last year while researching which epoxy product to use to refinish my gunite pool. In hindsight, I realize your response was 100% correct. I should have listen to your expert advice. 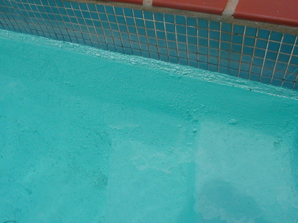 Your advice was to skim coat the pool with cement to fill the holes, then apply the epoxy product. Foolishly, I listened to the customer service people at Olympic who proposed an easier solution because they had a “better” product. 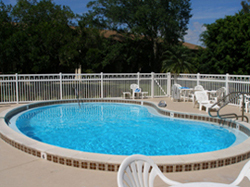 I sent them pictures and explained in detail the condition of my pool and they said their product would work. I followed their prep and application instructions to the letter and checked in with them throughout the process. below. Olympic’s response after I invested thousands of dollars in materials and labor – “…you’ll just have to live with it.” It was a mistake to trust them. If you have any thoughts or products that could help fix this I would greatly appreciate hearing from you. Feel free to use this email as a testimonial. I’d like to add to the list remorseful pool painters in your blogs. I previously talked to you on the phone but decided to cut costs and go with RAMUC Type A Chlorinated Rubber white paint. We religiously followed prep, application and dry time instructions. We were thrilled with the results initially – but within one month (after filling the pool) blisters started popping up everywhere ranging in size from a pin head to an M&M. The pool walls and floor feels like braille or bubble wrap, depending on the location. As you can see from the photos (from a distance) it looks beautiful – and still does. However, up close and personal just breaks my heart. I was planning a pool re-opening party but now I’m embarrassed to think about having to tell people “no popping or picking the blisters!”. Can we recover from this tragedy by using your product? 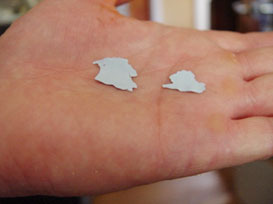 Would we need to sandblast 100% of the existing rubber paint off? I’m beginning to feel like we just need to bite the bullet and hire someone to PebbleTec or re-plaster but I can’t give up on a paint product solution. Please advise. I live on the gulf coast of Mississippi and my pool got hammered from hurricane Katrina. 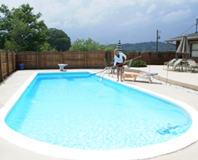 I purchased epoxy pool paint and primer from Leslie pool stores. I followed all the directions for preps listed on the paint can. This paint was supposed to last for eight years. 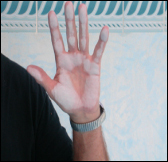 After only 3 years the paint has failed, see the attached pictures. This time I am using UltraGuard. I am confident I will see 100% improvement. Hi-Build. After fixing any problems with the plaster and following the prep exactly as outlined for the product we painted the pool. Within a few months I noticed blisters in the paint. When we opened the pool the following year if you ran your hand over the surface if would feel as if the pool was coated in bubble rap. Because of the cost of another do-over we made the best of it even though the surface looked pretty bad. Last year the chipping of any spot that had blistered was so bad it was clogging up the automatic pool vacuum and the pump filters. I knew that I had to repair the pool but I wanted to make sure I was not just pouring more money down the drain. I researched products on the Internet and went with Ultraguard. Ken was very helpful in making phone contact with me every step of the way. In fact he demands it. He answered every question and talked me through every step. I would highly recommend Ultraguard to anyone who needs to make an old pool look new.